B-type natriuretic peptide and glycaemia: an emerging cardiometabolic pathway? There is emerging evidence of cross-talk between the myocardium and systemic metabolic pathways. In particular, there is interest in the potential metabolic effects of A-type and B-type natriuretic peptides (ANP and BNP), produced in the myocardial tissue in response to ventricular stretch and cardiac overload. This commentary provides an overview of the evidence that natriuretic peptides promote lipolysis and enhance adiponectin production. In addition, we review new and existing evidence that BNP may directly improve glucose control, or else lower glucose indirectly via enhanced capillary permeability or greater renal excretion. Further investigation of the links between natriuretic peptide and glycaemia would seem important given the potential to reveal novel mechanisms to treat diabetes. It has been known for 50 years that heart failure patients suffer from chronically elevated catecholamines , which alter glucose metabolism by depressing insulin secretion and increasing glycogenolysis and gluconeogenesis, thus resulting in hyperglycaemia . Perhaps it is not entirely surprising, then, that B-type natriuretic peptide (BNP) and A-type natriuretic peptide (ANP), which are produced in response to cardiac stress and mechanical stretch of the myocardium and are physiological antagonists of the renin–angiotensin system, might also play a role in energy metabolism. The potential role for these peptides in metabolic pathways has already been the subject of intense interest, as both BNP and ANP are known to be potent stimulators of lipolysis in adipose tissue [3, 4]. Relatively little is known regarding the role of natriuretic peptides in glucose metabolism. Natriuretic peptide receptors are present in human pancreatic alpha cells , although the physiological significance of this is not well understood. Investigations of the effect of ANP infusion on glucose metabolism go back to the 1980s . Administration of ANP appears to increase circulating insulin , perhaps partly because ANP may be a substrate for insulin-degrading enzyme . A recent crossover study in ten fasting, healthy young men found that a high-dose ANP infusion stimulated a moderate increase in circulating glucose . Of potential relevance, any lipolytic effect of natriuretic peptides might be expected to contribute to a reduction in insulin sensitivity. Thus, there are several strands of evidence that ANP may have some context-dependent influence on glucose metabolism, although these strands are disparate and any effect of BNP on glucose metabolism is even less clear. In this issue of Diabetologia, Heinisch and co-authors describe a study of the effects of short-term infusion of BNP on circulating glucose, insulin and C-peptide concentrations during an IVGTT . The study involved ten healthy male volunteers who received both BNP and placebo, infused for 1 h prior to and during the IVGTT, in random order using a single-blinded crossover design. BNP infusion lowered the circulating glucose concentration by 12% during the first 10 min of the IVGTT (114 mmol/l during BNP infusion vs 130 mmol/l during placebo). There was a corresponding 13% drop in C-peptide concentration, indicating an appropriate beta cell response. The authors attributed the initial fall in glucose to a 19% increase in its volume of distribution in response to BNP. This explanation is consistent with evidence that capillary walls might be a barrier to glucose transport to interstitial spaces  and natriuretic peptides may increase capillary permeability . There may, however, be other explanations. Pre-infusion of BNP may have stimulated diuresis and urinary glucose loss [12, 13] (unfortunately, urinary glucose was not measured in the study by Heinisch and co-workers ). It is of note that the circulating BNP level achieved following infusion was extremely high (∼400 pg/ml; a concentration normally consistent with heart failure), perhaps increasing the likelihood of an appreciable diuretic effect even over the short term. Alternatively, the vasodilatory action of BNP may have increased skeletal muscle blood flow and uptake of glucose; the slightly higher heart rate on BNP might be attributable to increased catecholamine release. Even short-term administration of BNP suppresses the renin–angiotensin system, which in turn probably influences glucose–insulin homeostasis. What might these findings tell us about the potential role of BNP in insulin resistance and diabetes? It is hard to give specific conclusions in this regard because of the participants studied and the very short-term exposure to BNP. The fit young men studied, with a mean BMI of 23 kg/m2, probably had near optimal insulin sensitivity, making it difficult to show any improvement, particularly given the small size of the study. Investigation of the effect of BNP on insulin sensitivity in individuals with impaired glucose tolerance or frank diabetes would be of interest now that data on healthy participants are available. Studies of longer term elevation of BNP (and other natriuretic peptides) would also be of much more interest from a pathophysiological and therapeutic perspective. Other observations support the need for such studies. In a recent study of a relatively healthy community cohort, moderate elevations in natriuretic peptides were associated with a lower risk of type 2 diabetes . Data from Mendelian randomisation studies also suggest that moderate lifelong elevations of BNP protect against type 2 diabetes . Conversely, in cohorts comprising individuals in relatively good cardiovascular health, those who are obese or who clearly have increased insulin resistance and an elevated risk of diabetes also have reduced natriuretic peptide levels . Animal models also support the notion that chronic changes in natriuretic peptides might modulate insulin–glucose homeostasis. Transgenic mice overexpressing the gene encoding BNP were protected from diet-induced insulin resistance and obesity, compared with wild-type mice, as a result of mitochondrial biogenesis . Of further interest, BNP is known to have a strong positive correlation with adiponectin  and possibly stimulates its release from adipose tissue . Whilst this link could also account for a lower diabetes risk, the role of adiponectin in insulin sensitivity in man remains uncertain. This BNP–adiponectin link could also, at least partially, explain the association between higher adiponectin levels and an elevated risk of mortality and morbidity in some cohorts [18, 20, 21]. How could longer term studies to investigate the effect of BNP on glucose metabolism be carried out? One approach might be to use orally active compounds that inhibit natriuretic peptide breakdown. Neprilysin is a neutral endopeptidase that degrades ANP and BNP, and orally acting neprilysin inhibitors are available for both experimental and human use [22, 23, 24]. 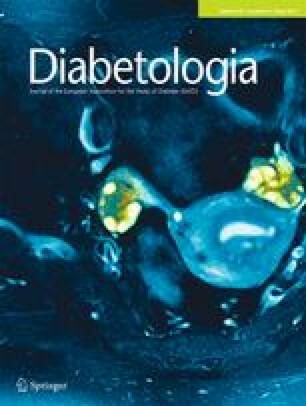 Given the evidence from Mendelian randomisation studies, neprilysin inhibitors (as well as being antihypertensives) may be beneficial for diabetic patients and patients with impaired glucose tolerance in improving insulin sensitivity. Further Mendelian randomisation studies may also help tease apart causal pathways. Hopefully the work of Heinisch et al will help stimulate more research on the role of natriuretic peptides in systemic glucose control. Collectively, these observations highlight the bidirectional relationships between metabolic and cardiovascular disease and the potential pathways underpinning these relationships (Fig. 1). The need to better understand the mechanisms underlying these relationships is clear, particularly the potential for manipulation of the pathways involved for the benefit of specific patient groups. We thank N. Sattar, University of Glasgow, for critical discussion of the manuscript. P. Welsh is supported by a British Heart Foundation fellowship grant (FS/10/005/28147). Both PW and JJM were responsible for the conception and design of the manuscript, drafting the article and revising it critically for important intellectual content. Both authors approved the version to be published.